(Colombia, 1970). Economist, writer, mentor, cultural promoter and international speaker. Chair of the Hispanic Heritage Literature Organization / Milibrohispano.org. Collaborator Member of the North American Academy of the Spanish Language (Academia Norteamericana de la Lengua Española, ANLE). Alfonso Lopez Michelsen’s National Prize for Communication and Journalism. Member of the International Academy of Social Sciences. Community Value Award by the Government of Colombia (Miami, FL). Order of Merit for Democracy, with the degree of Commander awarded by the Senate of the Republic of Colombia. Three-time award winner of the International Latino Book Awards for her book: El Expreso del Sol (first place in the category Best Non-Fiction / Autobiography in Spanish and second place in the category for Best Focused Book Non-Fiction in Spanish ), and her poetry books: Soles manchados (2015) and Pax de Deux: Relatos y poemas en escena (2014), in which she is co-author. As a children’s book writer, she is the author of Un regalo para Laura (bilingual edition, 2017), in which she explores the potential insecurities that family separation can cause during childhood; El mago del cielo (bilingual edition, 2018), in which she teaches us the value of every being of creation, and Carta a mis sueños™, course material for workshops focused on self-assuring and empowering children and young people to make their personal dreams come true through encouragement, entrepreneurship and social consciousness. Through her work, we witness her sensibility for social causes while showing different aspects of reality from a literary point of view. Her word has been included in several anthologies, such as: Voces de América (New York, 2016); Voces del café (New York, 2017); 20 narradores colombianos en U.S.A. (Colombia, 2017); and Aquí [Ellas] en Miami (Miami, 2018). She is currently working on an essay about the contribution of testimonial literature for peace processes, due to be published by the end of 2018, along with a renowned group of other Colombian writers. She has a Primary School Teaching Degree from Cali, Colombia, and worked as elementary and High school teacher. 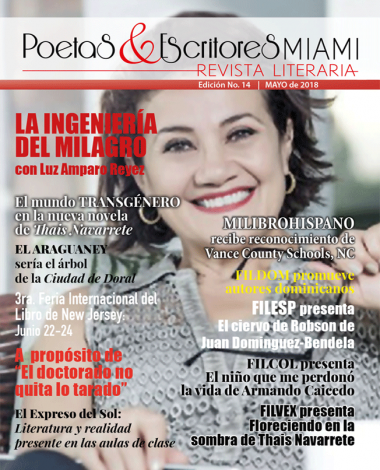 Her novel, El Expreso del Sol, featured on Revista de la Academia Norteamericana de la Lengua Española a cultural journal related to the Royal Spanish Academy (Vol. V No. 9, 2016); by the academic journal Hybrido (2016 version) and the Project Muse Hispania (ISSN 0018-2133, Vol. 100, No. 1, 2017, pp. 162-163). This work has also served as a guide to conduct workshops focused on women’s groups and is now part of the academic curriculum, as a literary text, for Peace Lectures in several Colombian schools. Economics graduate from Universidad Autónoma de Occidente (Cali, Colombia). Master’s Degree in Business Administration from Nova Southeastern University (Miami, FL), certificated in Human Resources Management from Florida International University with major studies in Marketing and Business Development. Her outstanding academic performance has awarded her the highest honor a Business student can receive — a membership to the Sigma Beta Delta, International Honor Society for Business, Management and Administration. She earned the CTI, Puerto Rico, certificate from the Harvard Negotiation Project model. Creator of the international celebration of the Hispanic Book Month and the Hispanic FIL Project: Ferias Internacionales de Libros (FIL) abroad. Chair of the XII International Convention of Female Writers Marjory Stoneman Douglas (United States, 2016); lifetime member of the International Society of Latino Authors (ISLA) and Editor in Chief of the Poetas y Escritores de Miami magazine. She works in several projects to support Hispanic culture diffusion as well as environmental preservation. Many reading groups have been renamed after her in recognition of her work, and the Isabela community, at Galápagos Islands in Ecuador, have dedicated their first library to her: “Biblioteca Ecológica Pilar Vélez-Zamparelli”, opened on June 30th, 2019. She recently received a recognition from Ecuador’s National Police Department for her support to the Poli Scouts. She has been interviewed in several media, including CNN en Español, by the renowned journalist Camilo Egaña in his program. Among the most important awards received by the Organization under her stewardship, the most important are the Vance County Schools of North Carolina, U.S. award, as Shining Moment Partner 2017-2018, for their ongoing support to the educational program, as well as the prize awarded by Galápagos’ Minister President, Ad. Lorena Tapia Núñez, for Milibrohispano’s ongoing support of the “Galápagos’ Plastic-free Culture”.